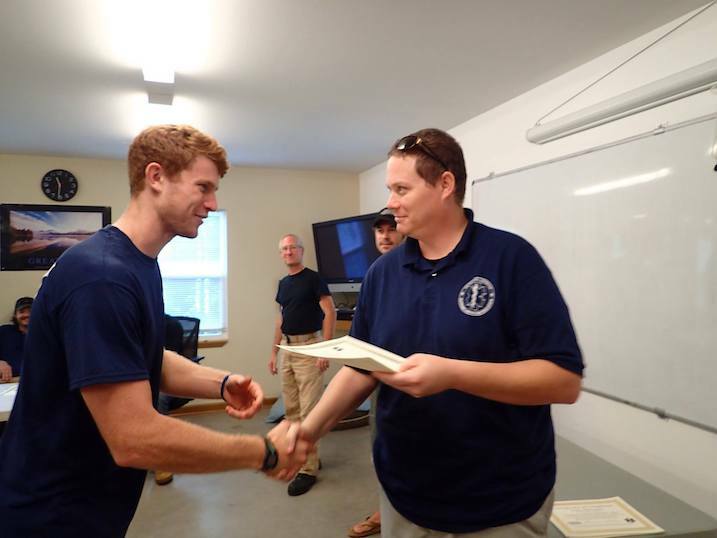 The economy is booming and we here at The National Center for Outdoor & Adventure Education (NCOAE) find ourselves in the position of seeking a few part-time instructors. Specifically, we’re looking for instructors to supplement our expanding team of EMT professionals who teach courses at our North Carolina headquarters. Among the many courses we offer is an intensive 19-day EMT-Basic course that satisfies eligibility requirements for the National Registry and NC EMT certification. These classes meet Mondays through Fridays with an additional 24 hours of clinical and field practice on either Saturday or Sunday. If you know anything about us, you know we pride ourselves with employing some of the very best instructors in the industry, and that includes instructors who are also EMT-paramedics, firefighters, military operations specialists, and experts in critical care management. Come early October, more than 100 seventh and eighth graders — along with an experienced crew of outdoor educators from The National Center for Outdoor & Adventure Education (NCOAE) — will be camping under the stars in Southern California’s Joshua Tree National Park. The only thing missing from this scenario are the outdoor educators, and if you meet the requirements, you could be spending Oct. 7-9 with 120 youngsters, staring up into a full moon, which, by the way, we are also providing for this particular NCOAE course. As you’re probably learning right now, NCOAE is a well-respected source for outdoor adventure and education for teens and adults who are interested in personal growth and professional and educational development. And the three-day excursion to Joshua Tree will feature one NCOAE staff member for each teacher and 10 students. That’s where you come in. If hired for this course, you will be responsible for facilitating a meaningful and safe outdoor education experience for some of these young outdoor explorers. What this entails is teaching specific aspects of the NCOAE curriculum — and not to worry because we’ll be providing paid training for that. If you’ve spent any amount of time surfing our website or reading this blog, you know that working at The National Center for Outdoor & Adventure Education (NCOAE) is more than just a job. It’s a reward. Working at NCOAE is a reward for many things, including: superior performance elsewhere; having a keen understanding of emotional intelligence and its impact on group dynamics; and, successfully teaching and guiding youths and adults in remote wilderness locations. Along the way, those who master technical outdoor skills – as evidenced by earning highly sought after certifications from organizations like the American Mountain Guides Association (AMGA) and the American Canoe Association (ACA) – also find that their hard work and dedication is potentially rewarded with an opportunity to work at The National center for Outdoor & Adventure Education. In other words, working as an NCOAE outdoor educator, instructor or administrative staffer isn’t possible for everyone who applies. Instead, our employment openings – some of which are referenced below – are only available for the best of the best.